Two, the Angel, and King John & Emperor Leopold after Victory in Vienna, are in the atrium on the first floor right where you enter the library. King John & Queen Marysienka and Allegory of Victory are on the second floor along the main walkway leading from the top of the stairs. 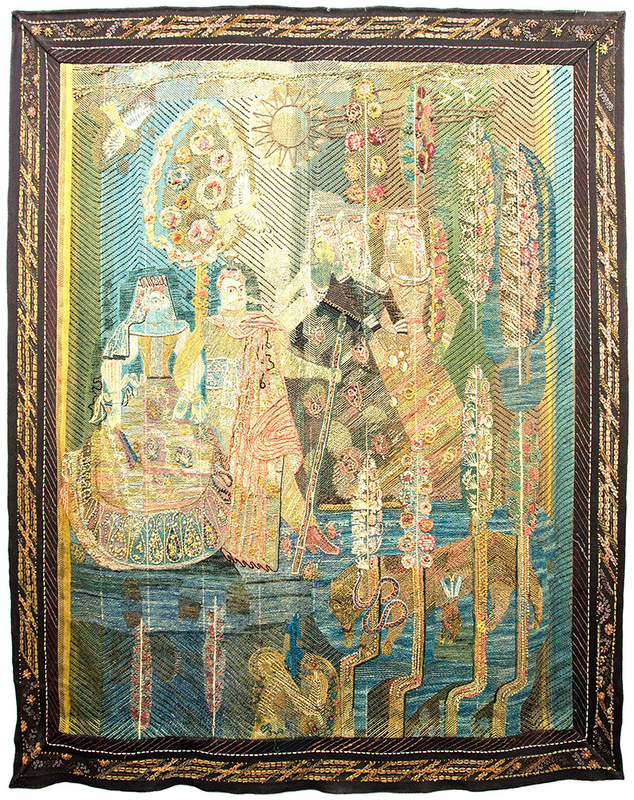 These were first exhibited in the Polish Pavilion at the 1937 International Exhibition of Art and Technology in Modern Life in Paris, but not in the manner long assumed, as in New York in 1939, as four separate tapestries, but as one immense tapestry. 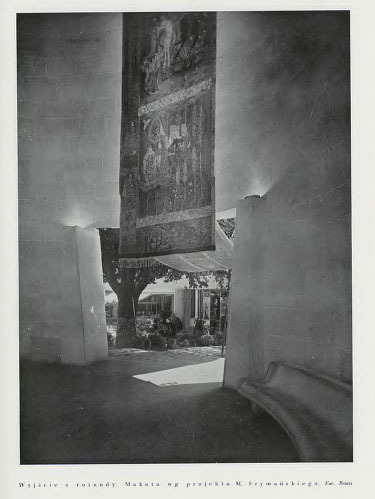 A double issue of Arkady magazine dedicated the 1937 Paris exhibition provides photographs of the Polish pavilion's rotunda exterior (Skibniewski, 558) as well as its interior space. 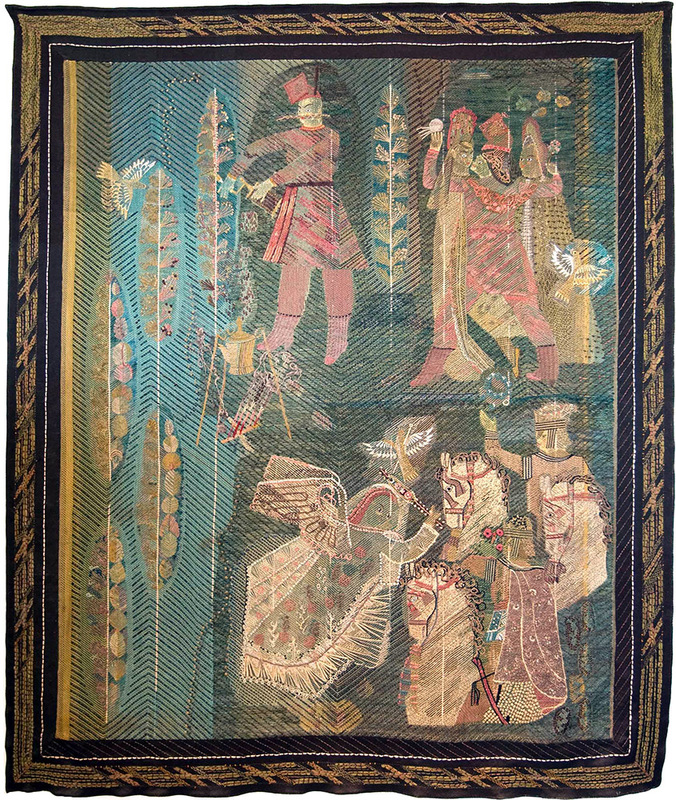 Poland's exhibit catalog lists a “makata” (tapestry of mixed media) interwoven with gold or silver. “Haft i gobelin” (Katalog oficjalny 1937) is also used which means tapestry in the French Gobelin style of weaving. 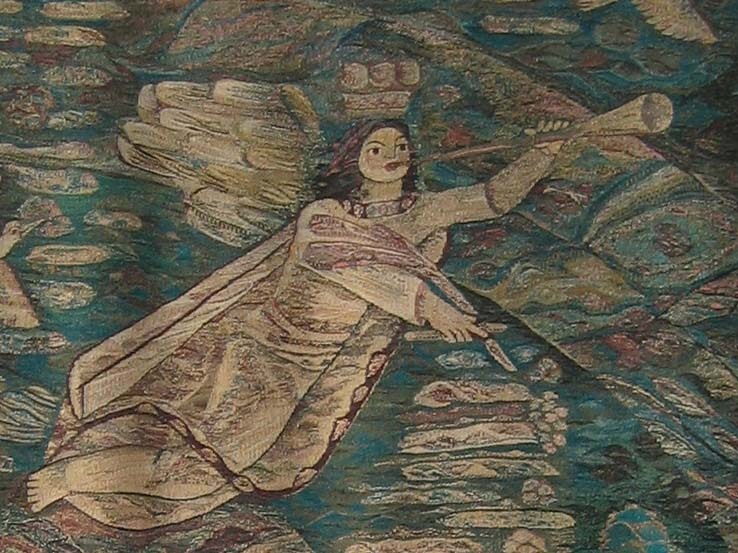 "The Angel" tapestry was created by this technique unlike the other scenes that have been described as the only known examples of tapestry with needlework superimposed. They are woolen with three of them embroidered with wool and silk thread with glass and metallic beads. Their current size is 9 by 7 feet each. 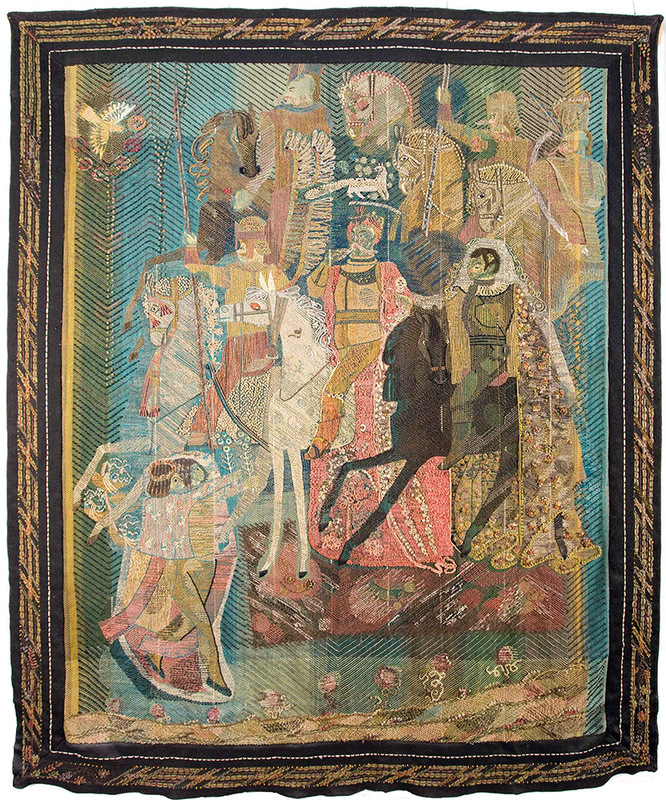 Originally they were all one piece, vertically connected, making this a monumental size tapestry (Bilewicz), suitable for Poland's tall, cylindrical-shaped honorary rotunda in its Paris pavilion. 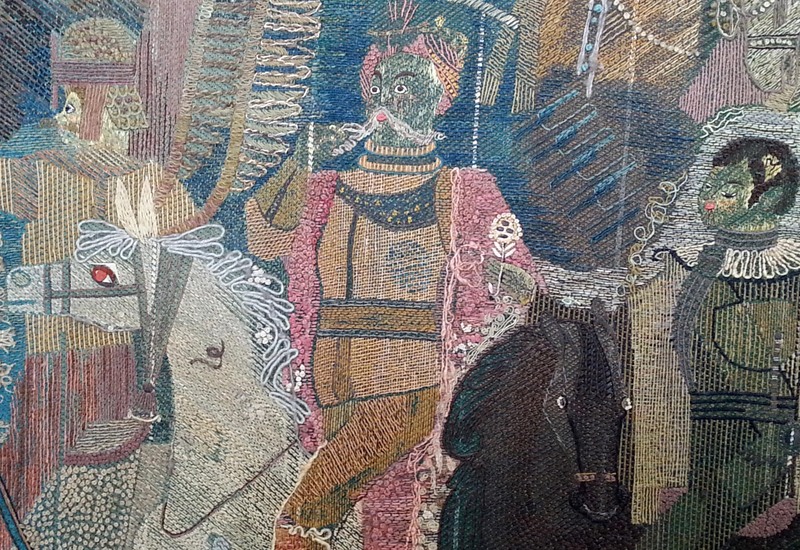 The official catalog lists the Syzmanski tapestry as "12 x 3.5 m" (Katalog Oficjalny, A20) which is nearly 40 feet tall. They commemorate the life of Jan Sobieski, elected King John III of Poland, 1674–1696, who was chosen by Emperor Leopold to lead the allied nations’ military forces that converged upon and defeated the Ottoman troops in 1683 outside the gates of Vienna, the capital of the Holy Roman Empire. They are the design of artist Mieczyslaw Szymanski (1903-1990) who was a student of Tadeusz Pruszkowski at the academy of fine arts in Warsaw. . Szymanski was primarily a painter. Many of his paintings are held in the Museum of Academy of Fine Arts in Warsaw. He was also interested in textile and fiber art. He was professor of textile design at the Academy of Fine Arts in Warsaw from 1949-1971. He is credited with being the first in Poland to use unorthodox materials such as coarse wool, sisal, hemp, leeks, straw, wire and wood in weaving. His student Magdalena Abakanowicz recalled his advice to think of a tapestry as a relief (Inglot 2004, 42). His ideas led to three-dimensional forms in fiber art later in the 1950s and 1960s (Inglot 2004, 8). Working from Szymanski's drawings, the weavers and embroiderers worked to bring forth the desired effects. 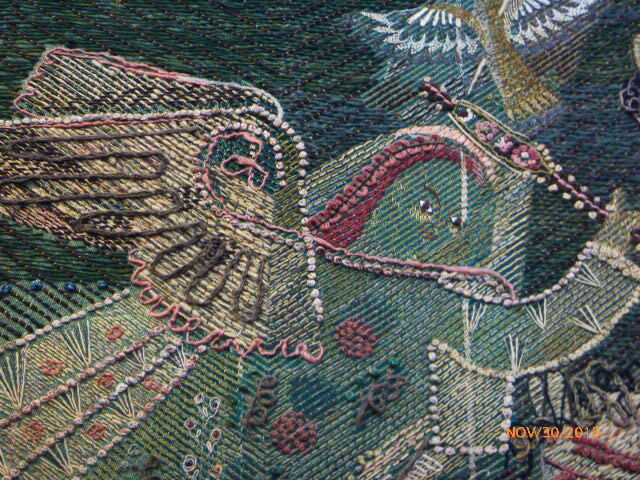 The works were woven and embroidered by the Lad Artists’ Cooperative, in Warsaw. The embroidery was directed by Maria Lomnicka-Bujakowa and conducted by the group Inicjatywa. Lad was founded in 1926 by professors and students of the Academy of Fine Arts in Warsaw. A variety of workshops were developed to teach and experiment with design—for furniture, ceramics, weaving, and embroidery. Lad artists originated the curriculum that called for a pursuit of “perfect workmanship.” In other words, they sought the best combination of form and function, a balance between the choice of material and technique (Zacheta 2012). 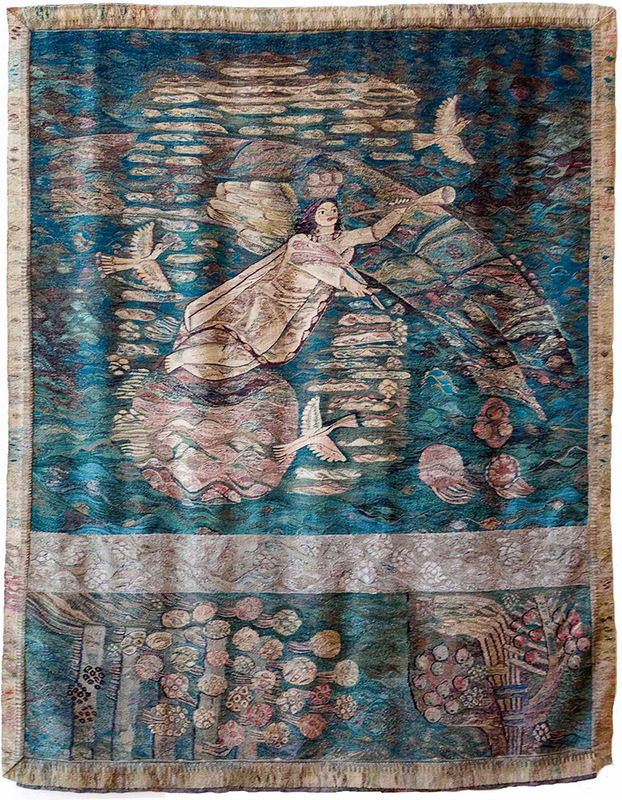 The tapestries are very much a collaborative effort between artist and craftsman. 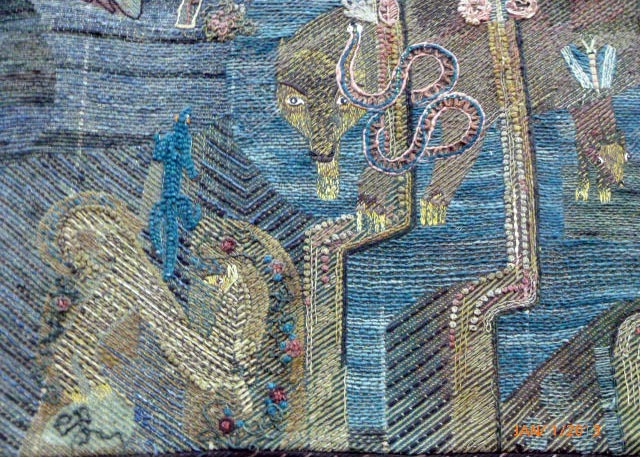 The artist had knowledge of weaving and embroidery. The artisans with their knowledge of design were able to introduce techniques of their own to achieve the desired effect. Maria Lomnicka-Bujakowa (1901-1985) studied decorative painting at the National School of Industry in Lviv with Kazimierz Sichulski. She continued her studies in the "Kunstgewerbeschule" School of Arts and Crafts in Vienna. Her specialties were graphic design, enamel, and weaving. After returning from Vienna to Lviv, she first worked as an artist in the Industrial Institute for Eastern Galicia in the department weaving and graphics. In 1928, she began working at the Vocational School in Lviv as a teacher of drawing and design and managed the art workshops. In the mid-1930s she led the National School of Clothing (Panstwowego Liceum Odziezowego) when she was also associated with Lad. She knew its co-founder Helena Bukowska, as both women taught weaving and embroidery and both exhibited at the Institute for the Promotion of Art in 1936. Widowed in 1945, she and her two children settled in Zakopane, where she spent the rest of her personal and professional life. She directed the Zakopane School of Lace establishing departments for weaving and embroidery (Tkaniny Marii Bujakowej Wystawa 2001). Note left border, since removed, making for an assymetrical display. Two tapestry panels out of view. The lowest portion is King Sobieski & Queen Marysienka with King John & Emperor Leopold after the Victory of Vienna above it. 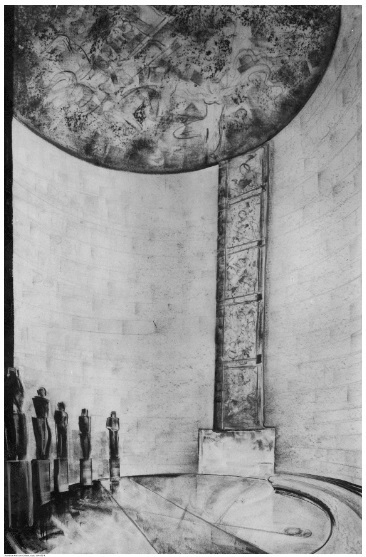 Honorary Rotunda of Polish Pavilion, 1937, Paris. From 1937 issue of Arkady magazine. Photo by I. Danko. Bilewicz, Hubert. "Sielanka i Polityka. Jan Sobieski na Paryskiej Wystawie (1937), in Wystawa Paryska 1937: Materialy z Sesji Naukowej Instytutu Sztuki PAN Warsawa, 22-23 Pazdziernika 2007 Roku, edited by Joanna M. Sosnowska, Warszawa: Instytutu Sztuki Polskiej Akademii Nauk, 2009. Huml, Irena. "Hafty Marii Bujakowej / Embroidery by Maria Bujakowa." Projekt 11.5 (1966): 44-7. Inglot, Joanna. The Figurative Sculpture of Magdalena Abakanowicz: Bodies, Environments, and Myths.Berkeley: University of California Press, 2004. Katalog Oficjalny Dzialu Polskiego na Miedzynarodowej Wystawie Sztuka I Technika, Paryski. Warszawie: Galewski i Dau, 1937. Piotrowska, Irena G. The Art of Poland. New York: Philosophical Library, 1947. Tkaniny Marii Bujakowej Wystawa 18 Lipca – 30 Wrzesnia 2001. Warszawa: Fundacja Cepelia Polska Sztuka i Rekodzielo and Zakopane Muzeum Tatrzanskie im. Tytusa Chalubinskiego, 2001. This work depicts a man perhaps at the abandoned camp of the Ottoman soldiers along with allegoric images of victory such as white doves and children offering flowers. The man stands over an abandoned camp fire that warms coffee as he holds a coffee grinder. Coffee houses were soon thereafter found in Vienna and, it is told, so did a bread roll in the shape of a stirrup in honor of the horsemen was created by Viennese bakers. This is part of the lore of the history of the bagel. The victorious Jan Sobieski rides beside Leopold who recruited him to defend Vienna. Their partnership was a success in saving Europe from the invading Ottoman Empire. Poland’s “Winged Horsemen” have feathered wooden sticks attached to their backs that made a deafening sound at full speed of the horses. Catching the Ottoman camp outside the city by surprise was all the more successful as the troops sounded more numerous than they were. Depicted with the royal couple are the ladies of the court in what appears as a garden scene. In the sky you can see the head and streaks of a comet that forebodes war (Piotrowska 1947, 191). In the foreground are the animals —a wolf, a snake, a weasel—signifying omens such as stealth, thievery, and attack. Full views by Charles Wainwright. Close-up fragments by Inga H. Barnello. Property of Le Moyne College.